All eyes were on Windsor Castle Saturday for the wedding of Prince Harry and Meghan Markle. Just about every news organization in the U.K. and the U.S. had live coverage of the event, complete with commentary — but only HBO had “Pasadena broadcast legends” Cord Hosenbeck and Tish Cattigan. Last seen covering the New Year’s Day Rose Parade, Cord and Tish are actually fictional broadcasters played by comedians Will Ferrell and Molly Shannon. 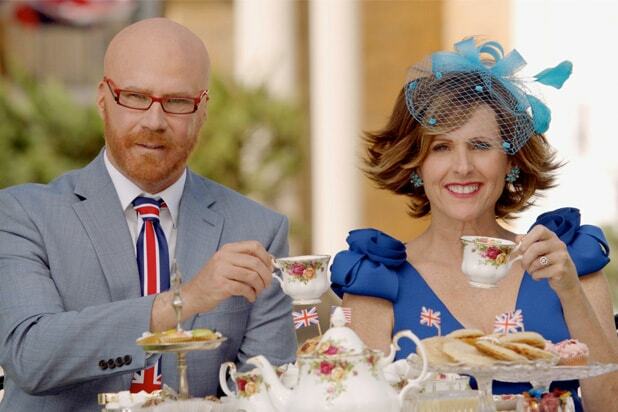 They — along with correspondents Tim Meadows and Sir Albert Langan-Kingsley, a British journalist, played by Kristen Wiig — spent Saturday morning in character to provide commentary about the wedding. From the rules guests had to follow, to Cord’s fear of horses, and how Tish tohought she could be a world-class jewel thief, Cord and Tish had everything about the wedding covered. Here are the most hilarious and weirdest of Cord and Tish’s comments. Tish: And then they will climb aboard a beautiful carriage and parade through the streets of Windsor! Tish: Yes, Cord. It is going to be magnificent! Cord: OK. Well, as you know, I’m not a big fan of horses. They just scare me. But here’s where you put the journalism cap on, and you try to be a pro… Just wish someone would have told me in advance about the horses. Cord: I would drop those rings. With my luck, they’d roll out of the church and down a storm drain. I’d be trying to fish them out with a string and a magnet! Fighting a rat for them. A stinky sewer rat! Tish: So that means no American President Donald Trump. Cord: Ouch, no Trumpy! That’s gotta hurt. Cord: These rules, they wouldn’t fly at a Hosenbeck wedding. I’ve got relatives who show up to weddings in tank tops and daisy dukes, and if you just look at them funny, they will throw down. In fact, I’ve never been to a wedding in my family that hasn’t broken out into a complex, violent fight. What do you think the chances are of this turning into a good old-fashioned brawl, a donnybrook? Tish: I don’t think there’s any chance of that happening at all, Cord. None at all. Tish: I think I would be very good at orchestrating a jewel heist. I mean, I would never actually do it, especially during the royal wedding. I’m just saying, in general, I have what it takes to make a good jewel thief. Cord: You know, I know we’re laughing at this, but I don’t disagree. Tish: The only part that I don’t like is the stealing. I don’t want to steal. I don’t want to break the law, and people’s feelings would get hurt! Tish: Did you know that Henry VIII is buried in St. George’s Cathedral, beside his third and favorite wife, Jane Seymour? Cord: Jane Seymour? “Dr. Quinn, Medicine Woman”? Where are you getting these facts, Tish? I think someone is messing with you. We have a British crew over here, and they have been difficult, to say the least. But I mean that with respect. Cord: You know what would be really cool, theatrically? If she came out of the church on a wire, like you see in a stage production of Peter Pan, and she flew above the crowd with, like, a wand, as if she was adorning the crowd with pixie dust. Tish: You should be a wedding planner! Cord: And there’s pyrotechnics, and she comes to a gentle landing in his arms. Roll credits! Tish: Call it a day! Cord: That’s the moment we have all been waiting for! That’s one small kiss for man, one giant kiss for mankind. Do you believe in miracles! Tish: Cord how much did you love that kiss? Cord: That was a Kay Jewelers kiss. Cord and Tish (singing): Every kiss begins with Kay. Every kiss begins with Kay. Every kiss begins with Kay. Cord: I’ve always wanted my own carriage. I actually installed four lanterns on the sides of my Honda Element so it would look just like a real horseless carriage. It was pretty cool, but when I get that baby out on the highway, look out. Those lanterns, they just fly off. They went everywhere. Hot oil all over the road. Tish: I actually brought something that could help. Have you ever tried exposure therapy, Cord? I did it a long time ago to get over my fear of ticks, and what it does is cures anxiety by exposing you to scary things a little bit at a time. So what I did for you today was, I thought your fear might come up, so I brought different sized horse toys. Close your eyes. Cord (opening his eyes to see Tish holding a tiny toy horse in front of him): Get that the f–k away from me! Get that tiny horse away from me. Horses are not ticks, Tish! They’re big living creatures that could stomp you to death with one hoof if they wanted. Cord: I had a full English Brexit of eggs, bread, cheese and scones. Of course, in America, we call it “breakfast,” but here it’s Brexit. Tish: As in Tim Meadows looks like he eats three Brexits every morning! I can get my digs in, I can’t help it! He really did balloon up. Meadows: People are losing their minds. There are teenage girls screaming and crying — teenage boys, too. Standing outside the royal wedding is like, it’s hard to put into words. Imagine being shot through the cosmos on a rocket ship and making first contact with an unknown life form. That’s what it feels like down here with the people on the ground. Cord: Wow, you’re getting all that from the crowd? Meadows: Yeah, they’re losing their minds, you know? Cord, I’m telling you, on television it might seem like this crowd is just staring at a very expensive rolling tea set, but the reaction to it, it’s as if you’re watching a newly resurrected Michael Jackson doing a three-mile-long Moon Walk, surrounded by angels and rainbows. Cord: You know, we have some time to fill. Tish, would you join me in singing the theme to “Sanford and Son”? Tish: We’ve been hearing the Spice Girls might reunite for a performance tonight! Cord: Wait, real quick: Can you name all the Spice Girls? Cord: There’s 17, so it’s tough. Cord: Cinnamon Toast Spice. Bodie Spice. There’s one girl who’s just called Mustard. Ghosty Spice. Silly Spice. There’s Angry Spice. There’s Grumpy Spice. Sleepy Spice, Conceded Spice, Jealous Spice. Sean Spicer will probably be there. Sir Albert: I have heard that they’re already sort of on that path. 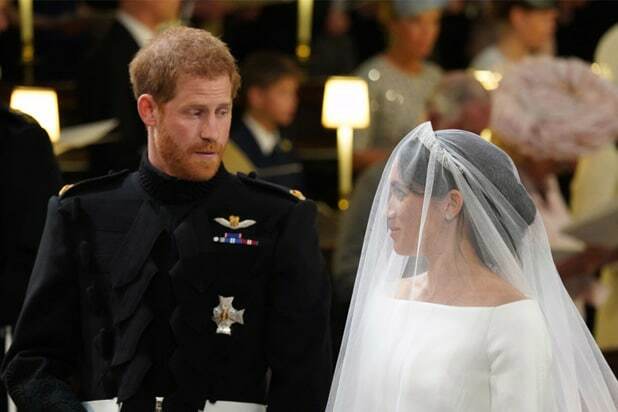 Cord: Are you saying that Meghan Markle is already pregnant? Sir Albert: No, I’m saying they already have, this is on good authority, two fully grown children. One is 28, one is 34, they’re both named “Gene,” and they live in Seattle. They both lead boring lives. This is what I’ve heard from my inside sources.